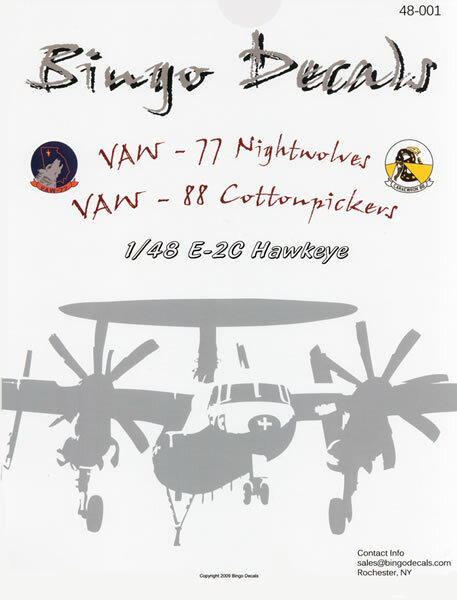 A newcomer to the aftermarket decal world, Bingo Decals was founded in September of 2009 and hail from Rochester, New York in the United States. 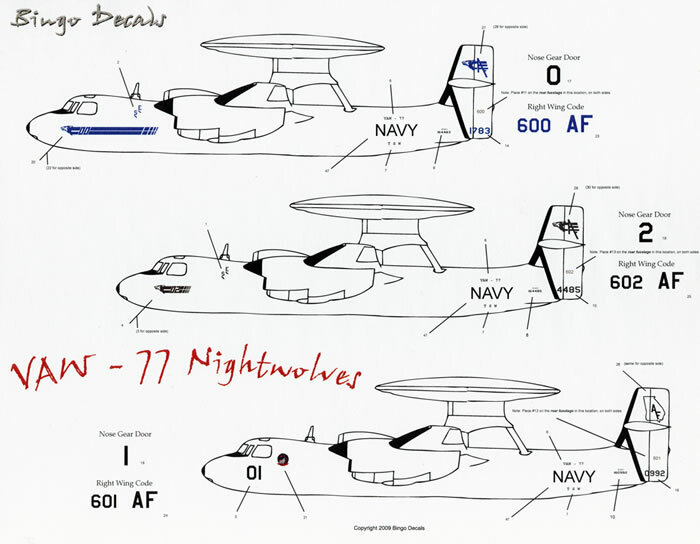 48-001 is their premiere release in a series of six sheets that provide markings for the U S Navy’s Grumman E-2C Hawkeye in 1/48 scale. 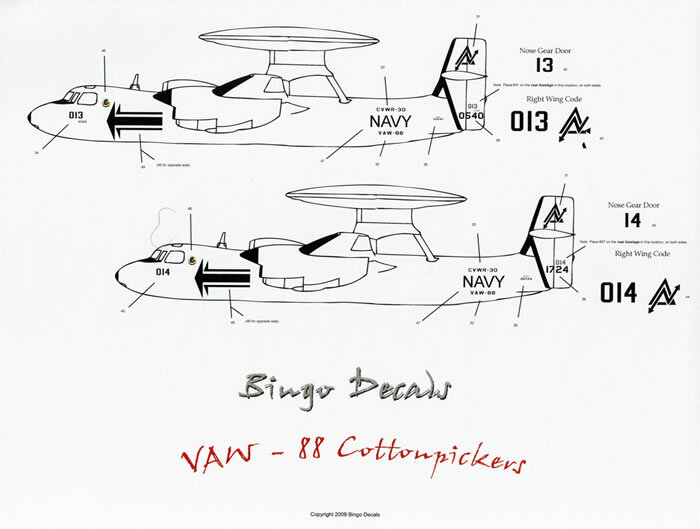 This sheet provides markings for five E-2C airframes, all of them for machines of United States Naval Reserve squadrons VAW-77 and VAW-88. Bureau number164483, Modex 600, of VAW-77. Bureau number164485, Modex 602 of VAW-77. Bureau number160992, Modex 601 of VAW-77. Bureau number150540, Modex 013 of the now decommissioned VAW-88. The supporting information is sparse. The two placement guides only have simple left hand side profiles of each option. To be fair to Bingo Decals this is probably all you really need as there are ample readily available images on the web to help you here. What is missing entirely though is any guidance on the paint schemes worn by the options. Earlier E-2s were finished in light gull grey upper surfaces over white undersides whilst later examples are in overall (glossy) light gull grey, again, the web will come to your rescue here if you simply type the squadron and bureau number into your chosen search engine. Still, it would have been nice to have the information included on the sheets. A thumbnail précis on the history of each squadron is also provided. There are errors on the placement guide as well as the decal sheet but these have been addressed and pointed out on an included “gripe sheet”. 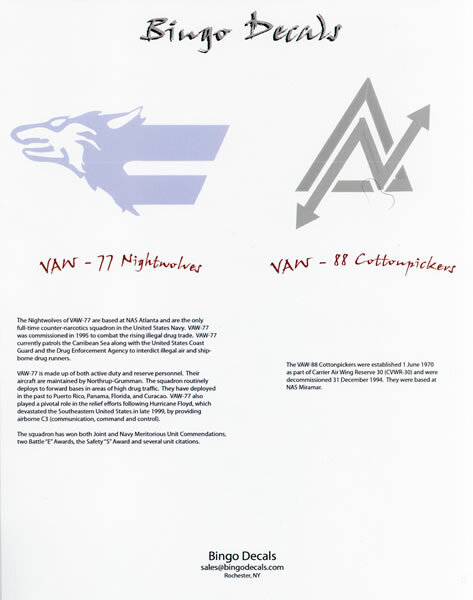 One of the issues is the fact that there is no white background to the blue VAW-77 squadron insignia. This has been addressed by the inclusion of an errata sheet that depicts the marking correctly. The decals themselves have been printed by Cartograf and are first class indeed. They are thinly printed and have a minimum of carrier film surrounding each design with everything in perfect register. Squadron markings and serials only are provided and you are on your own for national insignia as well as the stencil data but if you are using the new Kinetic E-2 kit fret not as the kit’s decal sheet provide all of it and it too is printed by Cartograf. The two placement guides as well as the two decal sheets come packed in a large 12″ x 9″ (305mm x 230mm) paper envelope with a clear front which is very reminiscent of the old Microscale/Superscale packaging. Included in the envelope is a thin cardboard “header” to save the decal sheet from being creased. If you rely on the postal system for your modelling supplies then this type of packaging can lead to issues as the size of the envelope is such that it is a little too large to slip easily into the average mail box without being folded. The paper packaging is can also lead to problems if your mail is delivered on a rainy day into a leaky mail box. 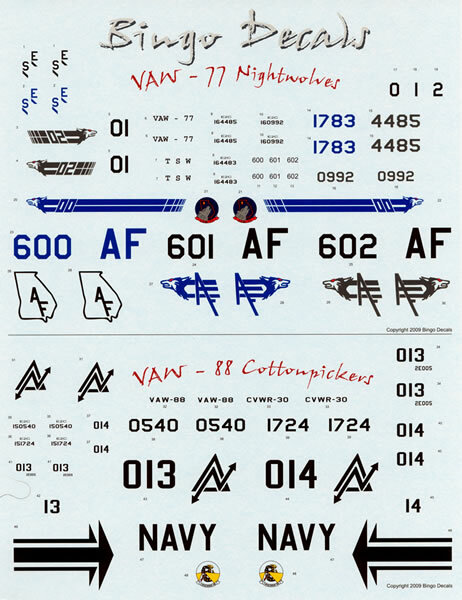 Fans of 1/72 scale will have to look elsewhere as Bingo Decals only produce them in 1/48 scale. Apart from the concerns above this is a great first release from Bingo Decals. It provides you with first rate decals to enable you to depict your new Kinetic E-2C Hawkeye in other than the kit decals.